Shower Jellies have been around for ages but this was actually my first one. They are basically body wash in jelly form and they fall under the skincare entertainment category due to their neat texture. I know Lush also makes shower jellies but I never felt the need to try them. Then, I got this Purederm Shower Jelly in one of my mystery beauty boxes, so I thought I might as well try it. I don't know if Purederm's shower jelly is a dupe of Lush's or vise versa, but it seems that none of their flavors overlap. Also, their base ingredients are pretty much the same but their extracts are different. 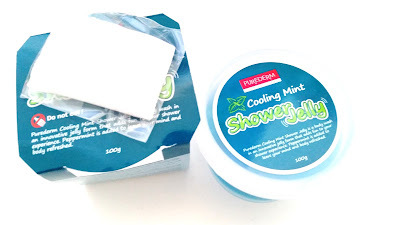 Anyways, let's get to know this Purederm Cooling Mint Shower Jelly! Product Description: A unique body wash in the form of jelly. The formula of the jelly body wash is gentle and non-stimulating. The shower jelly can be used on its own or with the shower mesh to create a lather. The shower jelly will spices up your shower experience, making it entertaining and fun. Its peppermint extract will leave your skin feeling refreshed. 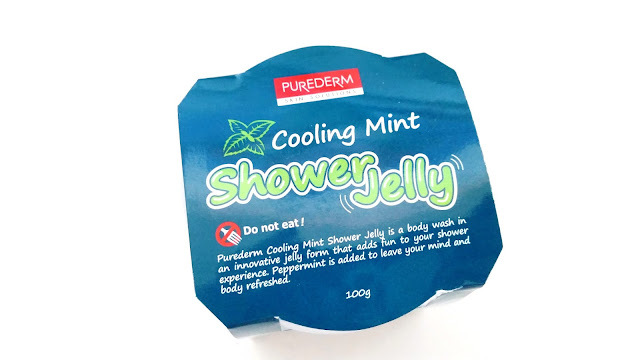 The Purederm Shower Jelly comes in 2 kinds, cooling mint and brightening milk. To Use: Wet the skin first. Remove the shower jelly from the tub and use it either alone or with the shower mesh provided to cleanse the skin. Rinse thoroughly after and towel dry the skin. 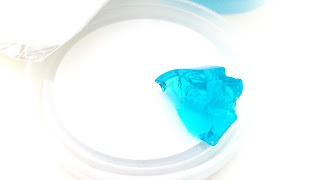 Ingredients: Glycerin, water (aqua), sodium laureth sulfate, chondrus crispus (carrageenan), mentha piperite (peppermint) leaf extract, melaleuca alternifolia (tea tree) leaf extract, salvia officinalis (sage) leaf extract, lavandula angustifolia (lavender) flower extract, rosmarinus officinalis (rosemary) extract, chamomilla recutita (matricaria) flower extract, cymbopogon schoenanthus extract, sodium benzoate, potassium sorbate, disodium EDTA, benzophenone-5, phenoxyethanol, blue 1, fragrance. Packaging: The packaging of this shower jelly reminds me of those jello cups you can buy at the groceries stores. Simple but packed full of information. It's nice though because it tells me exactly what's in it, how to use it, and any other information I might need. The container for the jelly is plastic with a twist off cap and it's fairly easy to use. Although the jelly can get stuck inside the container. I just ended up scooping mine out in chunks. The shower jelly also comes with a mesh to help it form bubbles. Scent: Peppermint is what this shower jelly smells like. It's quite refreshing. Although, in the shower the scent is more mild. Color: As you can probabl tell, the shower jelly is blue in color. The jelly is a bit see through as well. Texture: Jiggly and wiggly is how I'd describe this shower jelly. I was glad they included a shower mesh because it is so helpful. It makes sure that the shower jelly doesn't make an escape plan and run away from you in the shower. The jelly is formed and makes me feel like I'm playing with my dessert. Except, I can't eat these. My Thoughts: I thought this was going to be one of those gimmicky products that sounds fun but doesn't actually work. However, it actually works. I don't think I'd replace my usual (squeeze/pump bottle) body wash for this, but I know I will be using this until the end. The cooling mint is almost true to its name. When you open the shower jelly's container, you immediately get a whiff of that peppermint scent. It's refreshing and nice. However, I've noticed that the scent isn't as strong when you use the jelly in the shower. It's more mild but still noticeable. I also didn't feel any cooling sensations, despite the product claiming to have cooling effects. The product was gentle on the skin and it left my skin feeling soft. As for the amount of moisturizing properties it offers, I'd say it's about the same as my usual body wash, so nothing spectacular. 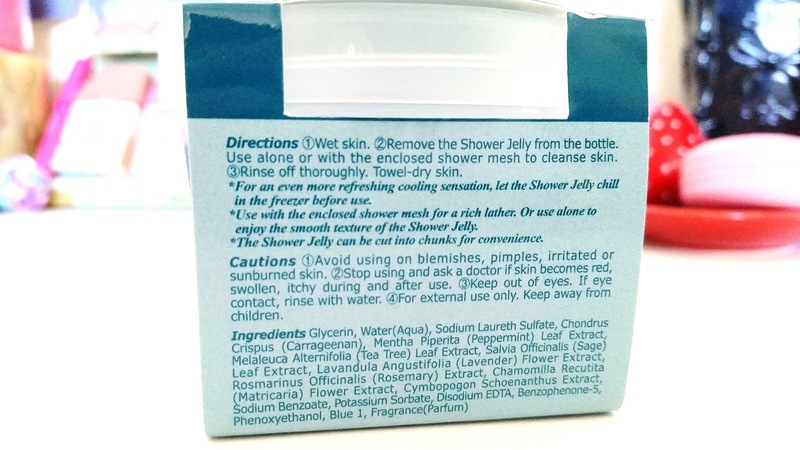 According to the instructions, you can use the jelly in 2 ways which is either with or without the shower mesh. I've found that it's easier to use the jelly with the shower mesh. When using it with the mesh, you don't have to worry about run away jellies (cause it's slippery) or it not foaming up nicely. Although, it's good to note that even with the mesh it doesn't foam up a lot, just a decent amount. 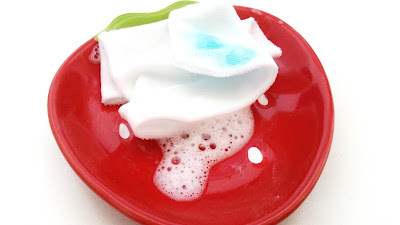 I'd say the jelly cleanses about the same as a usual body wash. That piece in the picture above was good for 2 washes, so a little goes a long way. Although, I think the jelly's overall size is smaller than your usual body wash too, so it kind of balances out. The shower jelly isn't hard to use, but compared to the usual body wash it's not as convenient. This is one of those products that falls under the skincare entertainment category because its jelly form is what draws people in. Its texture definitely helps it to stand out in the vast body wash market, however, I think it needs more oomph. Something to make the user want to come back and purchase it again. The jelly/jello texture is fun to play with and the shower mesh it comes with helps it to foam up but it just stops there. It doesn't offer any extra skincare benefits and it doesn't offer anything to draw me back to it. Unless you count the texture, but even then it's not enough for me to want to buy it again. This product ended up being a once is enough kind of product for me. 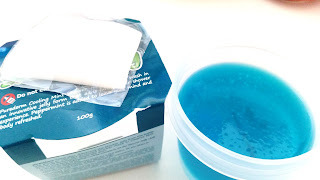 Final Thoughts: I can finally say I've tried a shower jelly, although it doesn't make me excited. I think the jelly texture of this product is definitely fun and adds a little skincare entertainment to my shower time, however, there's nothing to wow me. The moisturizing properties are just okay and although it promises to have cooling effects, I didn't feel any from mine. It does, however, cleanses nicely and the shower mesh included helps the product to bubble up while foiling its escape plans. Would I repurchase this in the future? Probably not. While the texture is unique, there's nothing this product offers that makes me feel like I want to go back to it. 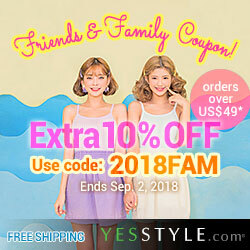 Do I think this product is worth a try? Well, that depends on you. If you've never tried shower jellies and would like to know how they are, then why not? It'll be a neat experience and it's inexpensive so it won't break your bank. These shower jellies will probably make nice gifts too.